Step 1 Put the kettle on to boil and tip the broccoli into a medium pan ready to go on the heat. Pour the water over the broccoli then boil for 4 mins. Step 2 Heat the olive oil in a non-stick wok and stir-fry the ginger, garlic and onion for 2 mins, add the mild chilli powder and stir briefly. Add the chicken and stir-fry for 2 mins more. Drain the broccoli and reserve the water. 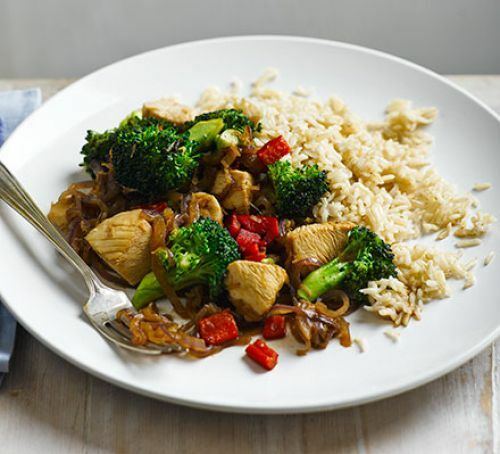 Tip the broccoli into the wok with the soy, honey, red pepper and 4 tbsp broccoli water then cook until heated through. Meanwhile, heat the rice following the pack instructions and serve with the stir-fry.